Reform Judaism in the north brought together both its cheder teachers and its Northern Learning House students for Live and Learn, a day of inspirational training and education led by Rabbi Debbie Young-Somers at Menorah Synagogue on Sunday 15 April. 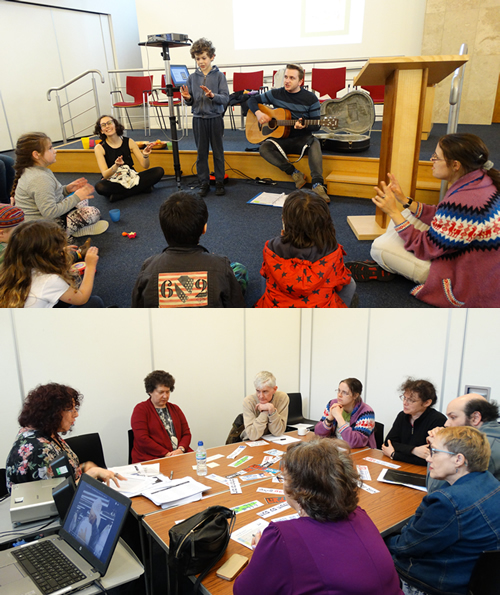 In this mini-Limmud style day, cheder teachers learned new musical skills and teaching strategies, while their own children were entertained by RSY-Netzer. Meanwhile the grown-ups learned about Israeli society through the medium of rap, thanks to Jo-Ann Myers, and Keith Kahn-Harris also came from Leo Baeck College to talk about geographical distributions of Jews. The Northern Learning House is a lay-led adult education programme with courses run in different locations, both physically and online ensuring that location is not a barrier to learning.